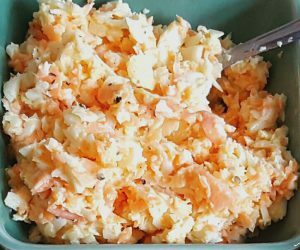 This is my final guest post for Jen, the doula from Your Birth Scotland, so I decided that I’d make it a recipe that was family friendly for mums who have their hands full and need a relatively quick, but nutritious dinner to serve their families. I figured everyone enjoys a good burger, so why not make it one that would be a great healthy option for both expectant mums and mums with families already? Beans are incredibly healthy because they are a nutritionally dense protein that is full of soluble fibre (which lowers cholesterol and regulates blood sugar levels, ensuring you have a slow and steady release of energy) and also insoluble fibre (the kind that prevents constipation and, shall we say, ‘keeps you regular’). Beans also contain folate, a B vitamin which prevents anemia and keeps our blood cells healthy, and magnesium, a key mineral required for our metabolism. Therefore, after reading about how nutritionally important beans are to our overall health I figured they’d be brilliant to make a good burger with. One of my favourite things to eat is a burger. I don’t know what it is about burgers that pleases me so much. It could be the tactile nature of sandwiching something seriously tasty between the two halves of a soft, fresh bun or it could also be the epic range of toppings that you can adorn your chosen burger with. These toppings include things such as cheese, a minefield of options in itself when you are faced with the choice of a cheese slice, a handful of grated cheddar or mozzarella, or a melting coating of blue cheese. You’ve then got the question of salad. Do you go for sliced tomatoes, crispy iceberg lettuce or a leaf or two of little gem, or fresh cucumber slices? There are other potential additions to your burger to consider too, such as whether to top it with jalapeños or gherkins. That’s before you even start looking at sauces! Or do you dare to go for all of the above, risking the entire structural integrity of your whole burger operation in the pursuit of the perfect bite? It’s evident that burgers are truly a risky, yet rewarding, business. As much as I enjoy a beefburger I also very much like a good bean burger. (I should probably mention at this point that I’m not vegan, I just enjoy eating vegan food quite a lot and I’m allergic to dairy so it makes sense to make vegan food because it doesn’t contain dairy.) 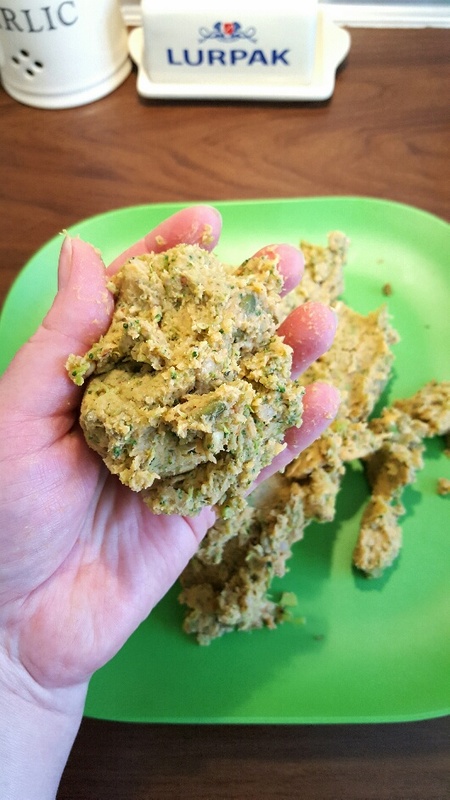 I like making bean burgers in particular because they’re really easy to make in the food processor , enabling me to knock up a quick dinner in no time at all. There’s also a wide range of flavoured bean burgers you can make, meaning I never get tired of them. 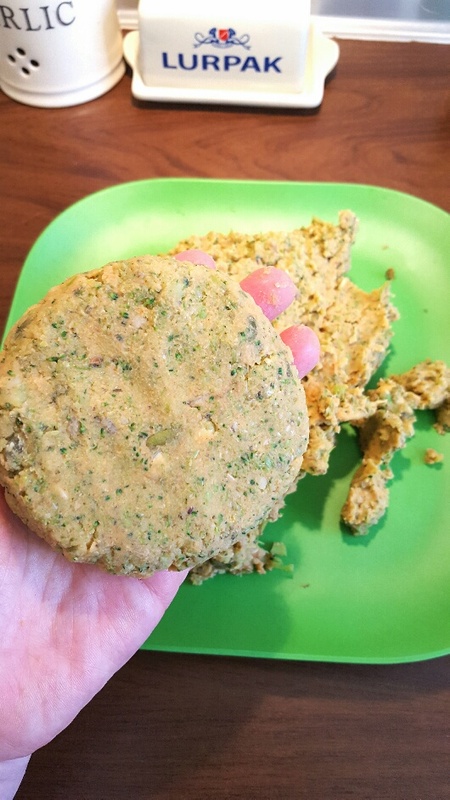 I decided to make these Broccoli and Butter Bean BBQ Burgers because I had some broccoli in the fridge and wanted to try it in a burger. The experiment worked quite well and I’m pleased to say that they are delicious. The broccoli adds a nice texture and the butter beans are bland enough that they don’t overpower the taste of the broccoli, but they absorb the BBQ flavours really well. 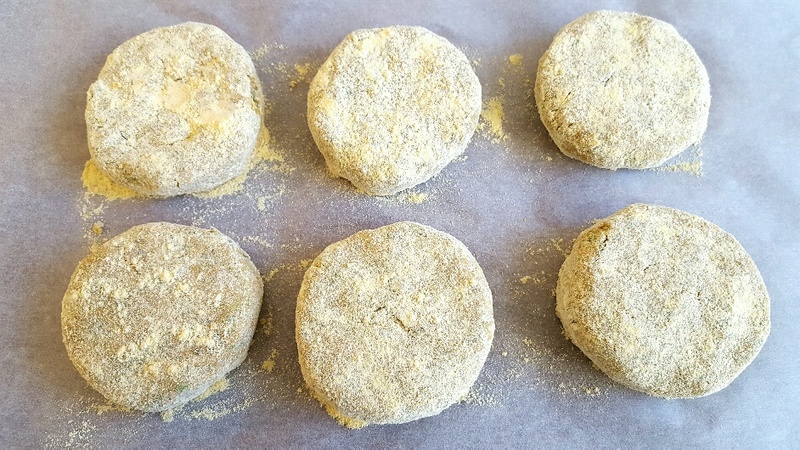 It’s cornmeal (polenta) coating helps hold the bean burger together, but crisps up nicely in the oven, adding a nice crunchy bite to the broccoli and butter bean BBQ burgers. 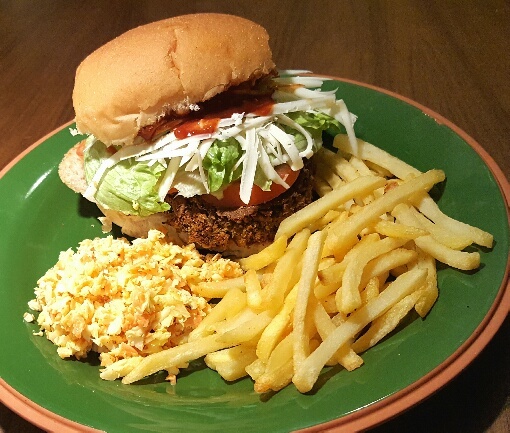 As a result you have a bean burger that has a great soft texture inside with a lovely crunchy outside. 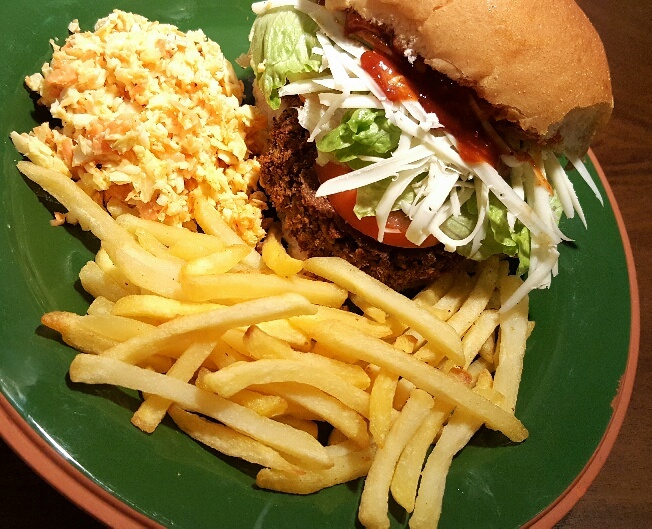 Serve your broccoli and butter bean BBQ burgers in a fresh bun with a selection of toppings, such as coleslaw or hummus (I used Deliciously Ella’s Sundried Tomato Hummus), grated cheddar/vegan cheese slice, tomato, lettuce, gherkins, jalapeños, vegan mayo or BBQ sauce with french fries on the side. As much mayo as suits your own taste. 2 tbsps of American mustard (or a hotter mustard, like dijon, if you prefer). 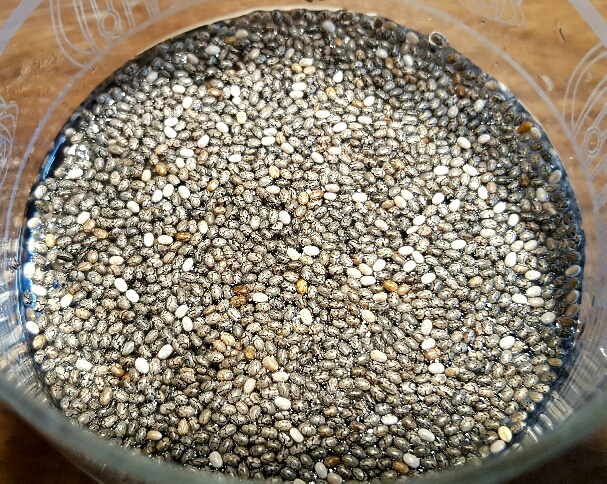 If you’re not using a normal egg, prepare the chia egg by mixing 1 tbsp of chia seeds with 3 tbsps. of cold water and leaving them to soak for half an hour. Cut the broccoli into small florets and steam in the microwave until tender. 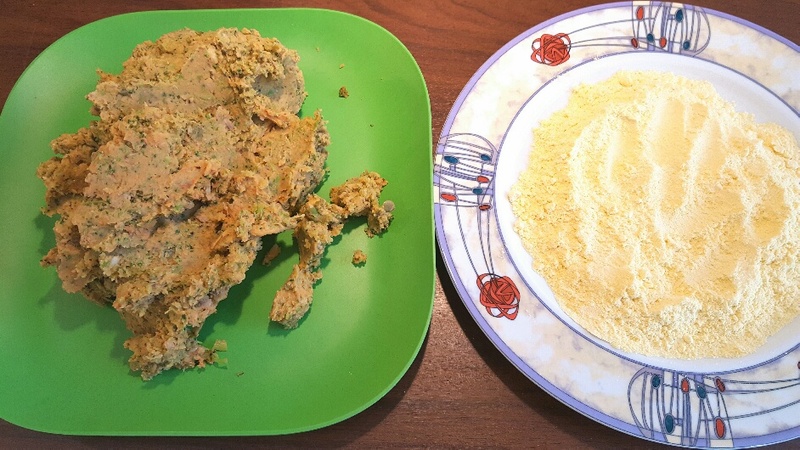 Place all of your ingredients in a food processor and pulse until it’s combined together. Empty onto a plate. 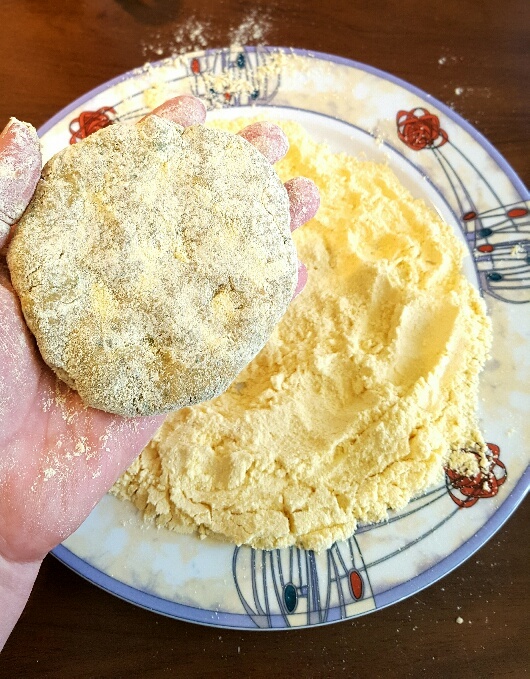 Sprinkle your cornmeal onto another plate and lay out a piece of greaseproof paper beside it, so you have a production line in place. 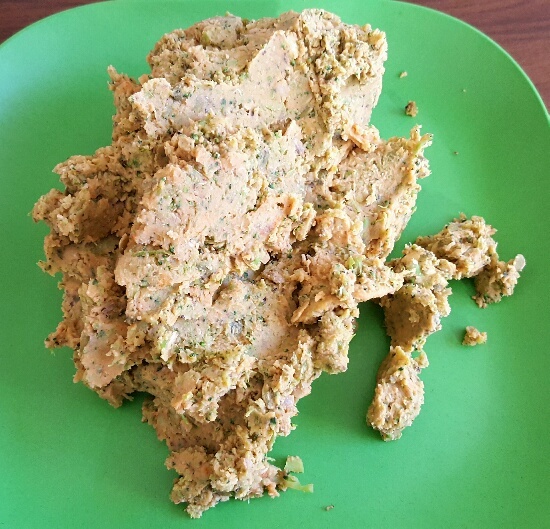 Take some of the bean burger mixture and form a burger patty with it before coating it in the cornmeal. Continue making burgers until all the mixture is used up. Place your burgers on the sheet of greaseproof paper and bake in the oven until they are golden brown. Serve in buns with whatever toppings take your fancy.